Let's see how to configure and embed Google Calendar to your website to make events visible to every visitor, who has access to your site (or intranet). 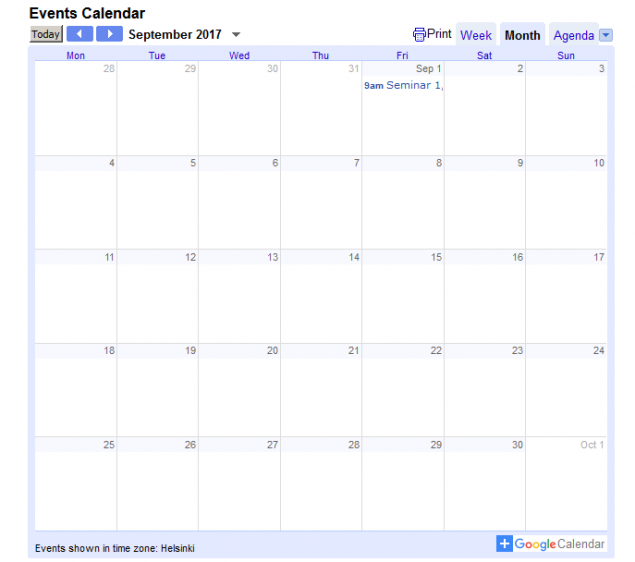 Embeding Google Calendar to your website is very handy way to share events on your website. 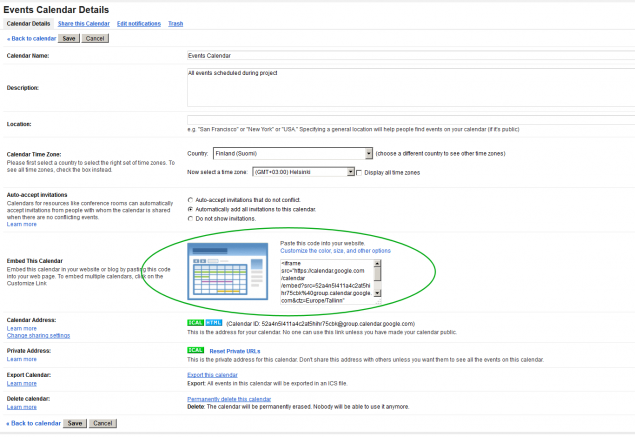 Let's see in further details, how to configure and make calendar visible on your website (or on Intranet). At first click on "My calendars" => "Calendar" => "Calendar Settings" (as shown on illustration seen on right side. On next screen, there are possibilities to edit calendar name, description, location and choose calendar time zone. After editing those, go copy code from "Embed This Calendar" and go back to your website. On your website, go to the page you would like to make calendar visible and open text paragraph editing dialog. On text editing buttons, choose the last on on second row, which has "HTML" written on it (with label "Edit HTML Source"). IMPORTANT! In the HTML Source Editor, you need to adjust calendar window width for your website dimentions. Most of websites, using FastLion CMS, have content column width around 635 pixels. Just edit it in the code as shown in illustration. 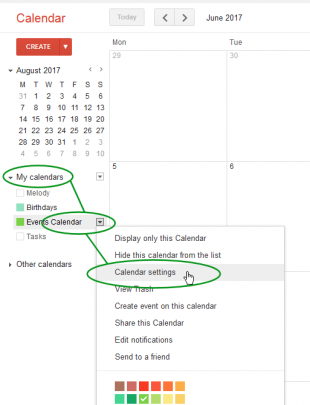 After saving Google Calendar code to "Edit HTML Source" dialog, Calendar appears on your website and it is accessible to everyone who visits your site. Various displays, and clear interface makes Google Calendar handy on making events on nearest weeks or months visible on your website. Good thing is also, that it is possible to share calendar editing rights in Google users system and allow multiple persons to add events to calendar. However, if you are mostly working on 6-month planning periods or need even longer timespans, Embedding Google calendar may not give best overview. Web Hosting Types - Which Hosting to ChooseThere are many different types of web hosting. Differences of these hosting services are determined by quality, flexibility and most importantly - by the amount of web server resources you may use for..
UK hosting web introduction. Find excellent hostsAny organization, which starts building it's website, needs site web hosting at some point. We take a closer look in this article, what is essential in web site hosting and how to find excellent UK ho.. Which Web Hosting Providers are Best?If you need web hosting and start comparing best UK hosts, there is quite massive information to digest - technical specifications, area of focus, limitations, support available, hardware, hosting man..
What is Web Hosting Uptime? How to Measure it?Uptime in context of Web Hosting Service, is the web server working time without failures. Uptime is important measure, because it indicates web hosting servers and maintenance quality. Embeding Google Calendar to your website is very handy way to share events on your website Let's see in further details, how to configure and make calendar visible on your website (or on Intranet) Let's see how to configure and embed Google Calendar to your website to make events visible to every visitor, who has access to your site (or intranet).